Eastern senior Jess Parker breaks away from a Southern defender during the first half of a Jan. 7 girls basketball contest in Tuppers Plains, Ohio. PARKERSBURG, W.Va. — The 2019 Battle Against Cystic Fibrosis Basketball Classic will be held Friday, March 29, at Parkersburg South High School. The girls contest is scheduled to tip-off at 5:30 p.m. and the boys game will follow at 7:30 p.m. The boys will participate in a slam dunk and 3-point contest during halftime of the girls game, while the ladies will have a 3-point shootout during halftime of the boys contest. Tickets are $5 apiece and the doors open at 4:30 p.m.
One local athlete will be part of the 18th annual event as Eastern senior Jess Parker will participate as a member of the Ohio girls squad. 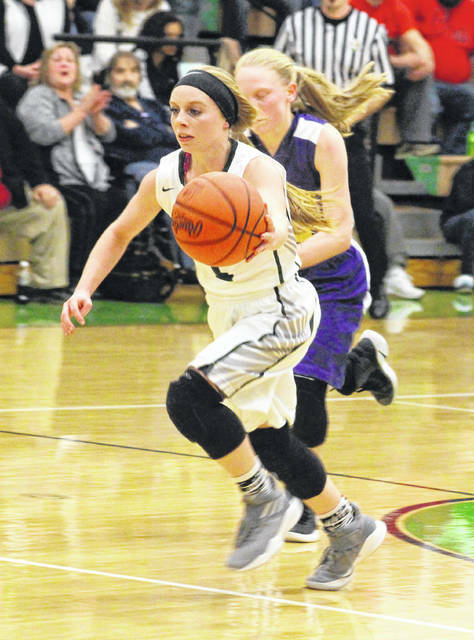 Parker was a second-team all-district and honorable mention All-Ohio performer for the Lady Eagles this season, averaging 11 points per game. Parker also garnered All-TVC Hocking and District 13 honors, as well as a first-team selection to the annual Ohio Valley Publishing 12 basketball team. Hannibal River’s Rick Isaly will be coaching the Buckeye State team, which has River senior and All-Ohio first team selection Lauren Flannery serving as captain. The West Virginia girls team will be coached by Rich Skeen of Sissonville. Parkersburg senior Shay-Lee Kirby will serve as captain for the Mountain State girls squad. West Virginia owns a 9-8 advantage in the all-time series for girls. Logan’s Chris Rider will be serving as the Ohio boys coach, and the captain of the boys Buckeye State team will be Wheelersburg senior Tanner Holden. Parkersburg South frontman Mike Fallon will lead the West Virginia boys team, with Parkersburg Catholic senior Cade Ullman serving as the team captain. The Ohio boys have won three consecutive decisions in the BACF Classic, but still trail West Virginia 12-5 in the all-time series. In addition to the basketball games, there will be a jump-rope exhibition by Jump Company USA between games — as well as a performance by the Parkersburg South Southern Belles dance team at halftime of the boys game. All proceeds from the game go to the Cystic Fibrosis Foundation. The Ohio and West Virginia rosters for the 2019 BACF Basketball Classic — both boys and girls — are listed below. Lauren Flannery (River); Rachel Adams (Waterford); Candace Caldwell (River); Tia Jarvis (Marietta); Emily Kern (Waterford); Allie Marshall (Fairland); Brooklyn May (Shenandoah); Jaycee Mayeres (Shadyside); Jess Parker (Eastern); Carsyn Reynolds (River); McKena Rice (Alexander); Rachel Richardson (Alexander); Bethany Starlin (Logan); Kelsie Warnock (Fairland). Shay-Lee Kirby (Parkersburg): Laila Arthur (Sissonville); Marleigh Bays (Sissonville); Taiven Clark (Parkersburg); Addie Furr (St. Marys); Sierra Hays (Parkersburg South); Kenzie Johnson (Parkersburg South); Josie Jones (Tyler Consolidated); Peyton Kocher (Tyler Consolidated); Breanna Lowe (Williamstown); Hannah Loy (Paden City); Jenna Pridemore (Williamstown); Lindsey Ullman (Sissonville). Tanner Holden (Wheelersburg); Caleb Bell (Logan); Coby Bell (Logan); Davis Black (Meadowbrook); Eli Chubb (Athens); Cooper Donaldson (Jackson); Justin Hynes (Athens); Clark Jennings (Caldwell); Boone Jones (Shenandoah); Clay Miller (Warren); Luke Nelson (Fort Frye); Noah Nichols (Warren); Caleb Wallis (Jackson); Austin Witucky (Marietta). Cade Ullman (Parkersburg Catholic); Bunky Brown (George Washington); Trevor Carder (Calhoun Co.); Jake Dennis (Parkersburg South); Seth Fallon (Parkersburg South); Tanner Lett (Doddridge Co.); Jacob McKnight (Parkersburg); Isaak Mooney (St. Marys); Brayden Mooney (Parkersburg South); Joe Muto (Hurricane); Kionte Peacock (Parkersburg); Griffin Phillips (Tyler Consolidated); Isaac Putnam (Ripley); Dylan Shaver (Parkersburg); Nick Westhaver (Ravenswood).